Signing up with the local dive shop for three days of diving off of Key Largo, our primary, 21st Century concern in the week before the trip is the All-American worry: “What time should we drive there and back to avoid the horrifying agony of Labor Day weekend gridlock? Over the course of the weekend, we find ourselves as repeat customers at Mrs. Mac’s, and agree we will return in the future, should we again be passing through Key Largo. We awake the next morning and caravan to the marina, where Christal Clear will be our dive operators. The Christal Clear dive boat is brand new, and we are all impressed by the design features – which show that the boat builders knew of the needs of divers. Today, our first reef is Snapper. 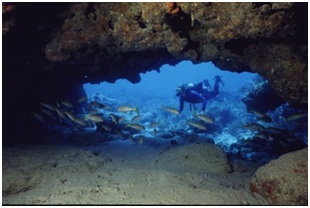 As it’s namesake indicates, Snapper Reef features colossally thick, seemingly endless schools of bright yellow snapper. I feel as if I am floating in a yellow cloud as hundreds of snapper surround me. This reef seems to explode with an enormous diversity of marine life. Our group gets dizzy as members repeatedly call others to see the latest “find” in all directions. Spotted eel, Moray eel, nurse shark, small rays, flounder, and the most gargantuan brain coral I have ever seen (about the size of a Volkswagen Beetle). 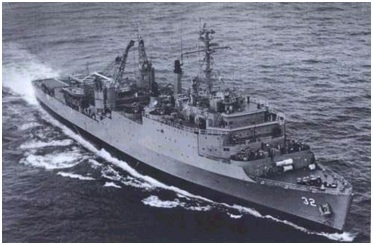 The ship had spent 12 years tethered in the Navy’s “Mothball Fleet” in Virginia’s James River. Fortunately, Hurricane Dennis (“Dennis the Menace”) uprights the ship in the summer of 2005. Today, it rests at a sandy bottom130 feet below, and because of its 90 feet of height, rises to within 50 feet of the ocean surface. The ship is about six miles off of Key Largo.